Daffodils English Academy is the one of best have Qualified Trainers. We prepare for a top IELTS bands, provide Individual attention to every student, we train you for IELTS in accordance with based lesson plan, top broadly and extensively cover all the skills tested on Exam.We have best teaching method. Hurry apply now to get more benefits. 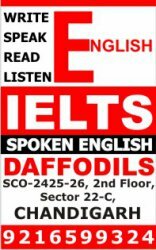 Daffodils English Academy has several braches located at Chandigarh, Ludhiana, Moga, Jalandhar, Amritsar, Jammu, Delhi, Noida. It is the first step towards success, personal as well as professional. But we often feel that speaking English is a very difficult task. To make it easy, practical and achievable, we have specially Organize a spoken English course. Our Services- IELTS Coaching, English Speaking, GRE, SAT, TOFEL, PD Classes, Interview Preparation, VISA File Preparation, SEO Content Writing Course, study abroad.